Those with fond memories of Lensbaby shots are likely to appreciate the firm’s new offering: the Sol 45. The company is heading back to its roots, with a straightforward design that evokes the original Lensbaby of 2004, though it’s really for those who have never tried Lensbaby lenses before and want to give one a go. For the uninitiated, Lensbaby produces tilt-shift lenses that create images with stylised selective focus and a distinctive look in blurred areas of an image. They're not the sharpest, but they’re not trying to be, and it's a lack of coating on the elements that's part of what gives images taken with a Lensbaby their signature dreamlike look. As mentioned, the Sol 45 keeps things extremely simple. It’s got a fixed focal length of 45mm and a fixed aperture of f/3.5, meaning that particularly shallow depth of field is all you’re getting. It’s also manual focus only, with no electronic contacts, and it produces a circular area of focus. The minimum focusing distance is 14 inches. Twin ‘bokeh blades’ can be deployed to add additional texture to your images and create the kind of stylised bokeh effects normally conjured in the edit, and these are situated on hinged arms that hide at the edges of the lens. The lens tilts to a maximum angle of 8.5°, though it can also be locked in a straight-ahead position for general shooting if you don’t want to fuss with tilting. In use it’s designed to be as easy as possible. You identify your frame and the subject that you want to be in focus, then swivel the Lensbaby towards this subject, before focusing and capturing the shot. As Lensbaby’s co-founder Craig Strong explains, "it’s designed for photographers who want to dip their toes in the Lensbaby pool." 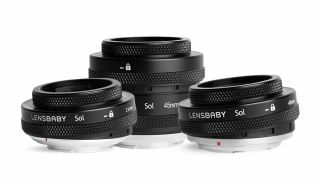 The Lensbaby Sol 45 is available for Canon EF, Nikon F, Sony A, Pentax K, Sony E, and Fuji X mounts. There also a separate smaller 22mm version specifically for Micro Four Thirds shooters, named the Sol 22. For a Micro Four Thirds sensor, this focal length works out as 44mm equivalent. The Sol 45 is priced at £169/$199.95, and is now available to order at selected retailers. For more details, see lensbaby.com.